The Great Six Fat Dutchmen direct from New Ulm, MN! 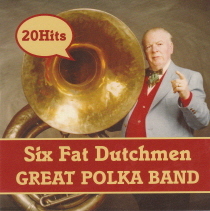 International Polka Music Hall of Fame® Harold Loeffelmacher left his mark with the great Six Fat Dutchmen. The Six Fat Dutchmen were from New Ulm, Minnesota and traveled throughout the USA and beyond. The band would often perform every night during a year. To this day the great Six Fat Dutchmen are recognized by many and held in high regard. This CD is full of great classic music!